A native of Youngstown, Ohio, Sarah Bates earned a Bachelor of Music in Music Education from Youngstown State University and studied with Tedrow Perkins. While attending YSU, she served as an oboist and bassoonist in the University’s bands and orchestras, the president of the school’s chapter of Ohio Collegiate Music Education Association, and founding member and oboist of both an experimental jazz group, AcoustiCombo and a woodwind quintet, Quintet Fantastique. For three years, she worked as an assistant marching band director in the public schools. Sarah also taught lessons in private and public schools throughout the Mahoning Valley region, including urban charter schools for special needs students. In addition to her work in Youngstown, Sarah spent three summers with the MasterWorks Festival in the USA and two years with the MasterWorks Festival in the UK as an orchestral oboist and English hornist. She performed as a bassoonist with the MasterWorks Festival USA Orchestra for one summer. Sarah toured with the American Symphony Wind Orchestra in 2007 as oboist, English hornist, and oboe d’amore soloist. She has served as an oboist with the W.D. Packard Concert Band, Warren Philharmonic Orchestra, and Greenville Symphony Orchestra. She has appeared in master classes with Linda Strommen, Richard Woodhams, and Gordon Hunt. In 2011, she completed the Master of Music degree at the University of Texas at Austin, where she was an oboe student of Rebecca Henderson. Also while at UT, she began playing baroque oboe, at first with the UT Early Music Ensemble, and later as a founding member of the Austin Baroque Orchestra. Sarah has recorded with the Youngstown State University Symphonic Wind Ensemble as well as the University of Texas at Austin Wind Ensemble on the Naxos label and with the American Wind Symphony Orchestra (CDs AWSO 0117 & 0118). 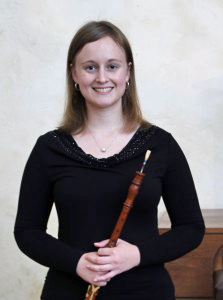 She is a member of the International Double Reed Society, Phi Kappa Phi, Music Educators’ National Conference (MENC), and the Christian Performing Artists’ Fellowship.